Future site of The Willard hotel on Glenwood Avenue. February 2018. 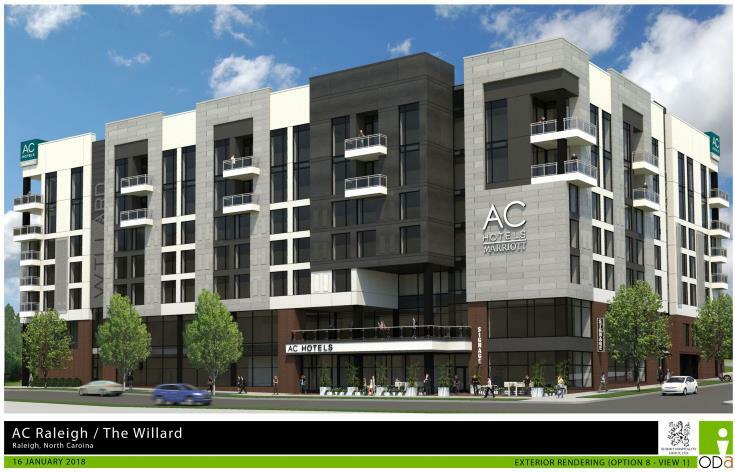 On the city’s website, a submitted Administrative Alternate for Design (AAD-1-18) shows renderings of The Willard, a planned hotel and condo building for Glenwood South. Taking a peak, I wanted to share those renderings here on the blog. As a refresher, The Willard will be an AC hotel by Marriott brand hotel on the southwest corner of Willard Place and Glenwood Avenue. The building will have hotel rooms and some residential units. 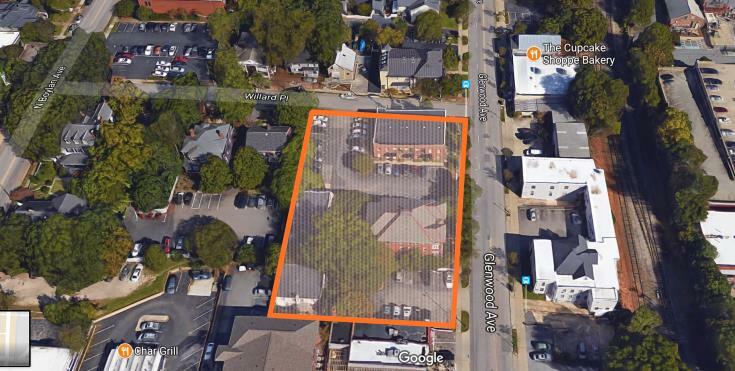 Shown in the photo above is the site of the project which will see the demolition of two brick office buildings and the surface parking lot in between. This particular AAD case seems to deal with the placement of the building and how far set back it is. I see a proposal for an outdoor amenity area which sits a little farther back than is required. Seems like a minor issue. Either way, here are the renderings. Email readers: This blog post has a virtual reality image. Read the post on the blog to see it. Plans submitted to the city for The Willard are showing a 7-story building for the southwest corner of Glenwood Avenue and Willard Place. 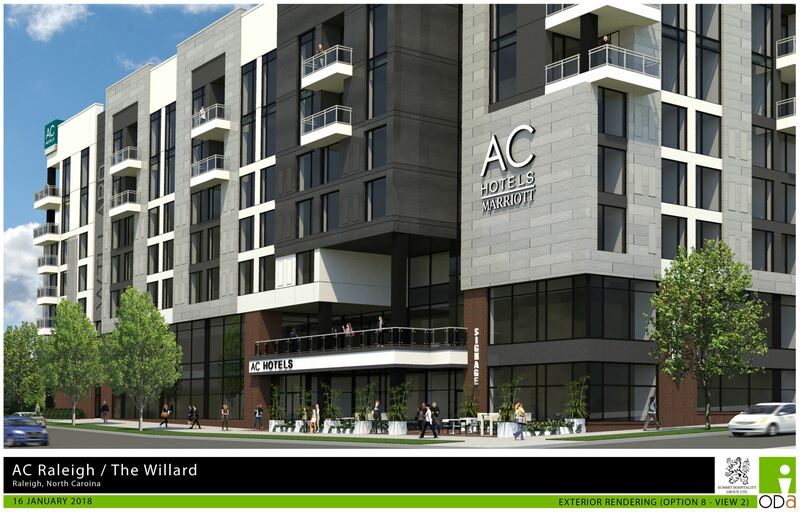 It will consist of 121 hotel rooms, 16 condos, and ground-floor retail. 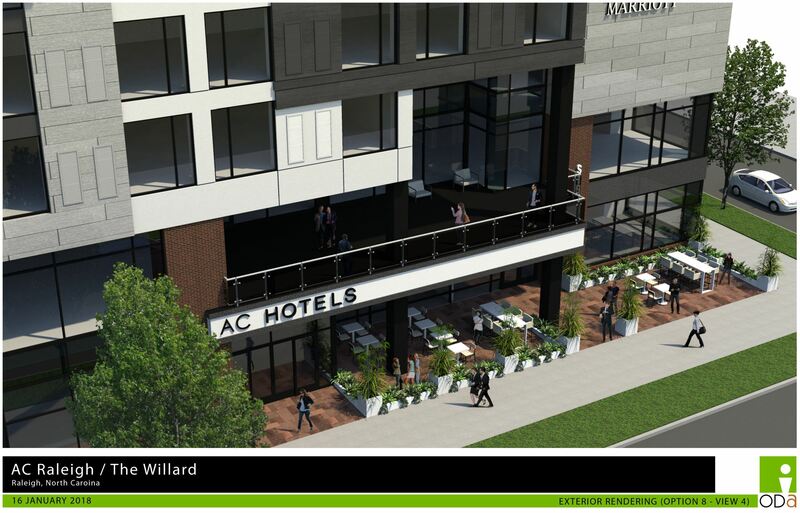 The hotel will be an AC Hotel by Marriott brand. Let’s get into the maps. 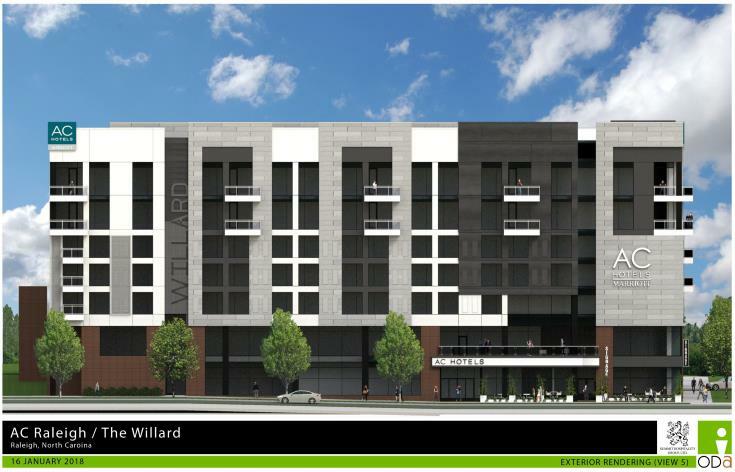 The brick office buildings and associated surface parking lots will be cleared out for The Willard. I want to say some residential units are here also but I can’t confirm. 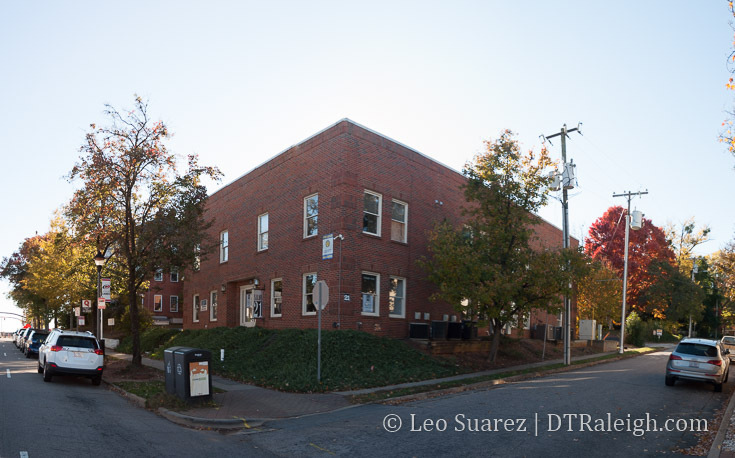 Maybe a reader knows more about the makeup of these current buildings and can share. 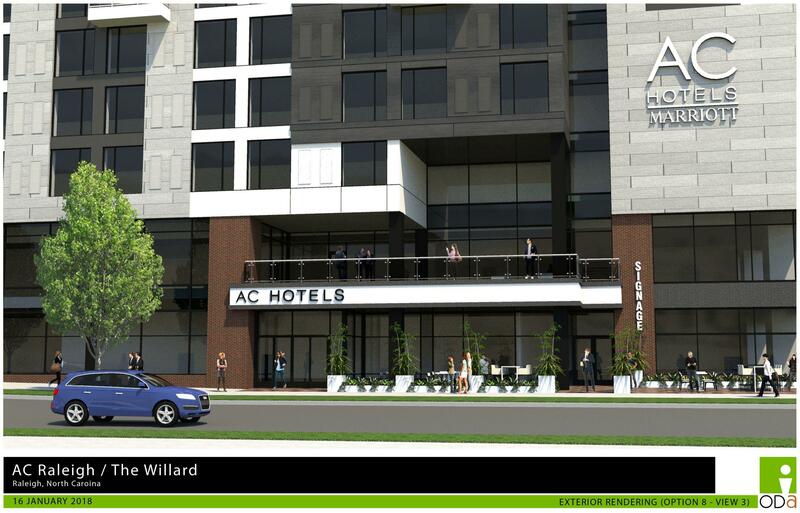 The Willard will have its own parking with an attached deck containing 61 spaces. 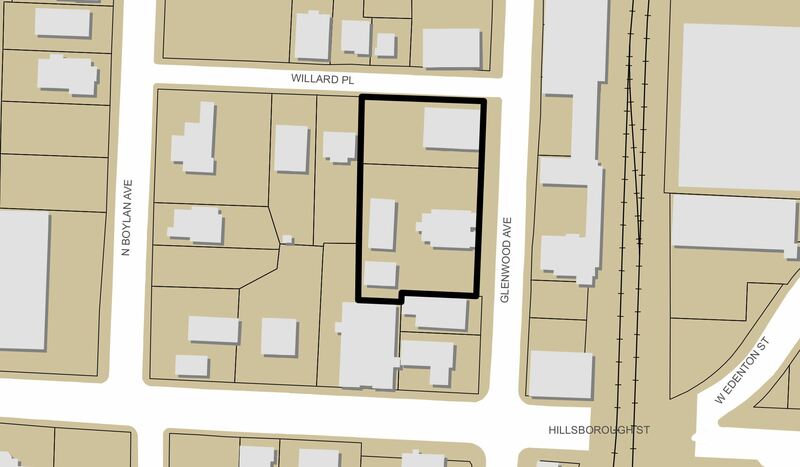 The entrance/exit will be on Willard Place in the rear of the building. 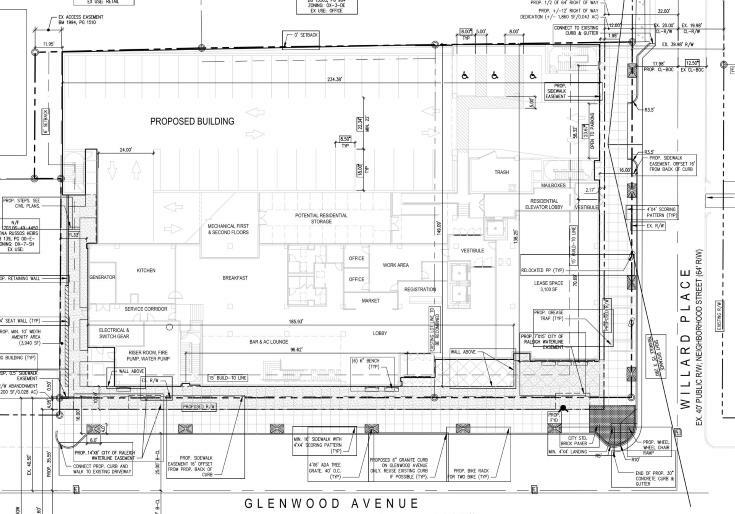 When looking at the site plan for the first floor, there’s a bit too many walls and glass for my taste. Glenwood South is one of our more intense pedestrian corridors so if this is the final layout I would consider this poor support for street life activity. Here it is below with only the lobby and one 3,100 square foot retail space on the corner of Willard and Glenwood. I’ll admit though that I have no experience with this “higher end” brand of hotel. The bar/lounge area may be a site in itself so maybe it’s not that bad. I’ve always felt that Glenwood South needs a solid southern bookend and One Glenwood is probably going to be it. The addition of a hotel on the southern end will help make the street feel longer with a variety of activity. Here’s a bonus, a VR view of Willard and Glenwood from November 2017.